Hotel Hoppa service to Terminal 4 which cost £5 single or £9 return. The only Heathrow hotel with direct access to Terminal 5 via a covered walkway and Terminals 1, 2, 3 & 4 via courtesy Heathrow Express/Connect rail connection. 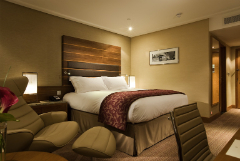 There are 605 non-smoking bedrooms inc. 27 suites, as well as 2 restaurants, 2 bars and a Tea Salon. The hotels leisure facilities include a range of shops inc. a jewellers and a Hair Salon; a luxury Health Spa & Gym. Rooms have a queen-size MyBed or 2 single beds, minibar, soundproofed windows, air conditioning, flatscreen TV, pay-per-view channels wifi access, radio, safe, phone,tea and coffee tray. Superior rooms are larger and have FREE breakfast in the Vivre restaurant. Executive rooms, larger again, have FREE Internet access, FREE light breakfast in Club Millesime. Club Millésime Lounge access. Access to Terminal 5 via a covered walkway and Terminals 1, 2, 3 & 4 via courtesy Heathrow Express/Connect rail connection or - the Hotel Hoppa service at the hotel for guests travelling to Terminal 4 using the H53 and H56 buses which cost £4.50 single or £8 return. 2 restaurants, 2 bars and a Tea Salon, allowing you to experience haute cuisine or the opportunity to slip into the lounge for afternoon tea or an intimate night cap. Served 6:30am to 10.00am £19.95 at per person. 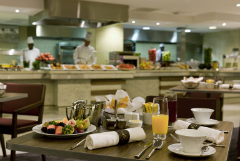 Superior rooms have FREE breakfast in the Vivre restaurant. Executive rooms have FREE light breakfast in Club Millesime. The Spa offers 5 treatment rooms, Relaxation Room, 24-hour Gym, Hydro Suite including Steam room, Sauna and Vitality Pool. Charges will apply. (complimentary use of 24 hour gym) Adults only (16+). Junior Suites (Family Rooms): 35sqm/373sqf, bathroom with bath and separate walk-in shower, sofa bed ideal for up to 2 children. FREE WIFI or broadband Internet access, FREE light breakfast in Club Millesime, Selection of FREE soft drinks in minibar. Club Millésime Lounge access. Leave the M25 take the exit at junction 14, following signs for Terminal 5. At the top of the hill, join a dual carriageway and you can see the Terminal 5 building ahead of you. Cross the roundabout, taking the second exit, still following signs for Terminal 5. Keep left and you will see signs directing you to the Sofitel. In front of the hotel, the road splits. Keep right to drive through the barrier into the Sofitel. 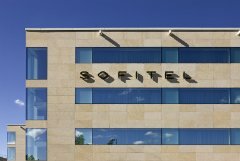 The Sofitel is connected to the terminal by a covered walkway. It's less than five minutes' walk. The Heathrow Express runs from Paddington station to T5 every 15 minutes. When you leave the terminal building walk to your right to take the lift. 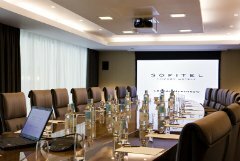 You'll see signs for the Sofitel. Terminal 5 is also connected to the other Heathrow Terminals via the free Express train. If you're arriving at Terminals 1, 2,3 or 4, or coming via Piccadilly Line tube, it's easy to continue on to Terminal 5.